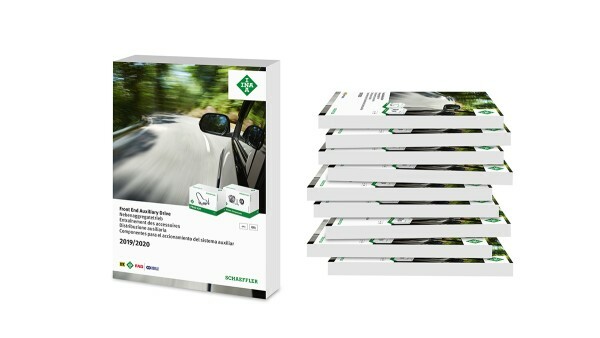 With over 300 repair solutions, and more than 1,800 individual parts, Schaeffler’s new “INA Front End Auxiliary Drive 2019/2020” spare parts catalog for passenger cars and light commercial vehicles is more comprehensive than ever before. Schaeffler has collected its wide-ranging portfolio of repair solutions and individual parts for the front end auxiliary drive in a new edition of the spare parts catalog “INA Front End Auxiliary Drive 2019/2020.” The company has been developing innovative products for the FEAD for decades under its INA brand. The Aftermarket specialists now offer the automotive spare parts market the right repair solution for over 100 vehicle manufactures, which covers more than 97 percent of the European fleet. “With this market-leading product portfolio, we underscore our system expertise for the auxiliary drive, which is becoming more complex and more important all the time,” said Christian Kos, Director Engine & Chassis at Schaeffler Automotive Aftermarket division. In the roughly 1,200-page catalog, garages will not only find over 300 FEAD KITs, but also a complete range of individual spare parts like overrunning alternator pulleys, tensioner and idler pulleys. Newly-added to the catalog are crankshaft vibration dampers, crankshaft decouplers, and over 600 single belts. The catalog also lists components for vehicles built between 1950 and today – meaning the repair of older vehicles with less-complex auxiliary drives can also be done quickly and efficiently. Fixing a modern auxiliary drive, on the other hand – with different aggregates like power-steering pumps, air-conditioning compressors, or alternators that have to be operated as well – means intervening into a complex system. It is often difficult to diagnose exactly which part of the belt-driving system is damaged, and which part could fail next. “This is why, with an eye on long-term repair, we recommend always replacing all of this system’s components,” said Christian Kos. “Our INA FEAD KIT has proven itself especially valuable here. With it, we offer garages a complete repair solution for the front end auxiliary drive that combines all the components they need for optimal repair.” A time-consuming search to collect these components individually is unnecessary, and the mechanic has more peace-of-mind when installing the parts. INA FEAD KITs contain a tensioner pulley, an idler pulley, a V-belt and a graphic diagram showing the vehicle-specific belt path. Depending on vehicle application, the repair solution can also contain an optional overrunning alternator pulley, a water pump, a crankshaft vibration damper and other accessory parts. When using the new reference work from Schaeffler, part identification is simple and precise as well. Clearly organized with a logical catalog structure, garage employees can quickly find the spare parts and repair solutions they are looking for. All content is in five languages – English, German, French, Italian, and Spanish. Garages can obtain the “INA Front End Auxiliary Drive 2019/2020” spare parts catalog for passenger cars and light commercial vehicles from the distribution partners of Schaeffler Automotive Aftermarket division. The catalog is also available for downloading at www.schaeffler.de/en and at www.repxpert.com.